WELDING FILTER BAG, China WELDING FILTER BAG, Quality WELDING FILTER BAG manufacture by COX Filter Cloth. Welding filter bag:COX Filter Cloth supply micron filter bag with best price. COX Filter Cloth select quality Polyester and Polypropylene needle felt in the industry. Industrial Filter was first in the industry to offer a rounded bottom weld configuration to better fit your retainer basket. The result is durability, consistency & performance for industries most challenging applications. Our moulded only from virgin resins, offers a unique four point positive seal. Made from chemically resistant, flexible plastic. 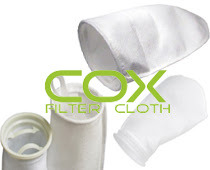 COX FILTER CLOTH select unique design adapts to most any filter vessel, ensuring bypass free filtration. Raised integral handles make bag change-out quick and easy so you save time and money. Ultra strong 100 % thermally bonded welding process ensures bypass free, thread free seams and improved filtration efficiencies. Flexible construction allows the filter bag to form to the shape of the retainer basket creating support as differential pressure builds. Available in all standard sizes.